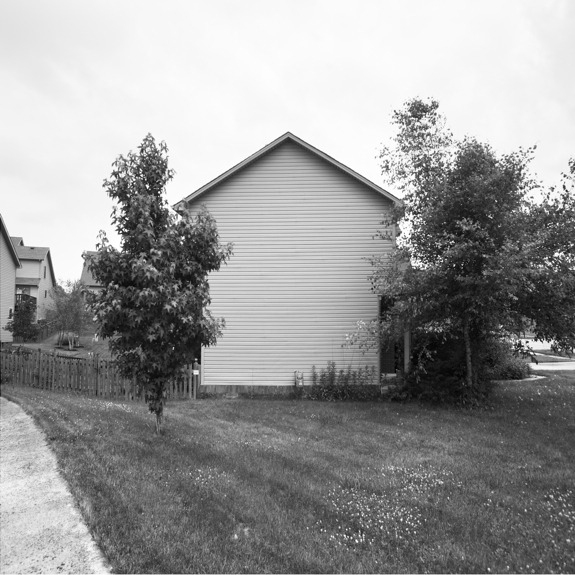 Residential Facades focuses on the documentation of suburbia: overgrown and under-planned. These continuously replicated structures boast an overwhelming sense of the generic; the nature of which is an indicator of the death of the local. The result of which is the eventual decline of spatially-derived identity and the emergence of a generic suburban, or dare I say American, vernacular. These unadorned “facades” act as a veil of wealth and stability. They hint at the American dream, which in light of current national fiscal status it seems we can no longer afford. The title itself confronts us with a convenient double entendre, one simultaneously describing the physical face of these homes (and in turn our neighborhoods and projected identities), and the illusion behind which lingers the fragility of a nation.